After hitting an 18-month high on an intra-day basis last Monday, the price of Copper price has come under pressure as the Bullishness about the impact of Donald Trump’s $500-B infrastructure plans on demand for the Red metal pauses. Friday, Copper at 2.6155 trading at support levels on the 3-day chart, while that holds, it could re-attempt to 2.75. A break below current marks could take it down to 2.50. Sideways movement in the 2.45-2.75 is possible medium term. After underperforming other metals and steel making raw materials in Y 2016, Copper is still looking healthier than pre-Donald Trump with a 20% rise YTD. The change in sentiment is important considering the radical shift in the positioning of large-scale derivatives speculators such as hedge funds. 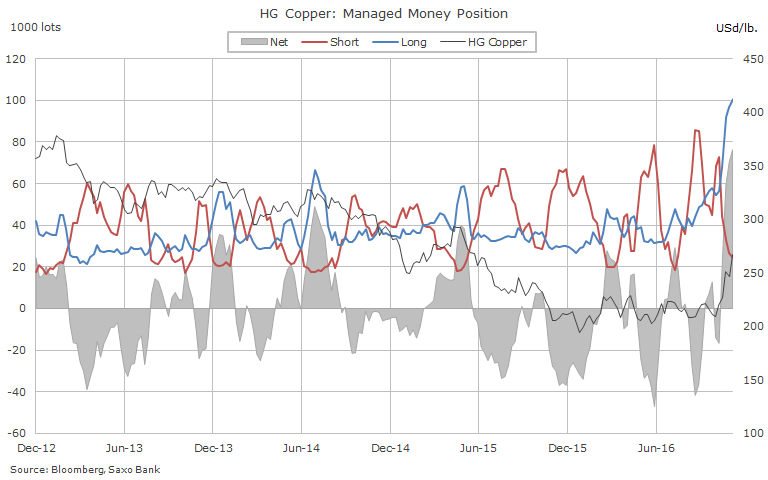 While continuing to reduce Bullish Silver (SLV), Platinum and Gold (GLD) bets, on the Copper market hedge funds have added to long positions, aka bets on higher prices in future, for 3 weeks running. According to the CFTC’s weekly Commitment of Traders data up to 22 November (released last due to the US long holiday weekend) managed money investors have taken the net long to an all-time high of 76,346 lots or the equivalent of just over 1.9-B lbs.